Successfully Added Windows 10 + Android 5.1 Tablet PC - 2GB RAM, Intel Cherry Trail CPU, 32GB Memory, 10.1 Inch Screen, Bluetooth, OTG to your Shopping Cart. Can't make your mind up over which OS is best for you, well why settle for one when you can have two. This Android 5.1 and Windows 10 tablet PC brings both operating systems together on one dual boot tablet. Play Windows games and take advantage of the wide range of support for productivity software. By simply adding a Bluetooth keyboard you can enjoy a fully fledged laptop experience. Alternatively for those Android lovers you get the familiar easy to use Android 5.1 OS with its access to millions of apps so you have the best of both worlds for work and play. A 64Bit Intel Cherry Trail processor that reaches speeds of 1.84Ghz offers solid processing power and is joined by 2GB of RAM, more than enough for a smooth lag free operation no matter what tasks you have in mind. With 1280x800 resolutions this large screen tablet shows all your media and content in great HD quality and has a good brightness and color range for clear, sharp enjoyable viewing. The large screen 10.1 inch display is big enough to let you use this tablet as a proper PC and have it replace your laptop. All you need to add is a keyboard and you have a portable device that can do it all, browse the web, play games, show movies and let you work with ease. Even with two operating systems the 32GB of internal storage and slot for 64GB micro SD cards brings plenty of storage space for all your files. There are front and rear cameras so you can conduct video chats and snap photos to share online while OTG support lets you transfer data via memory pens or plug in extra peripherals. 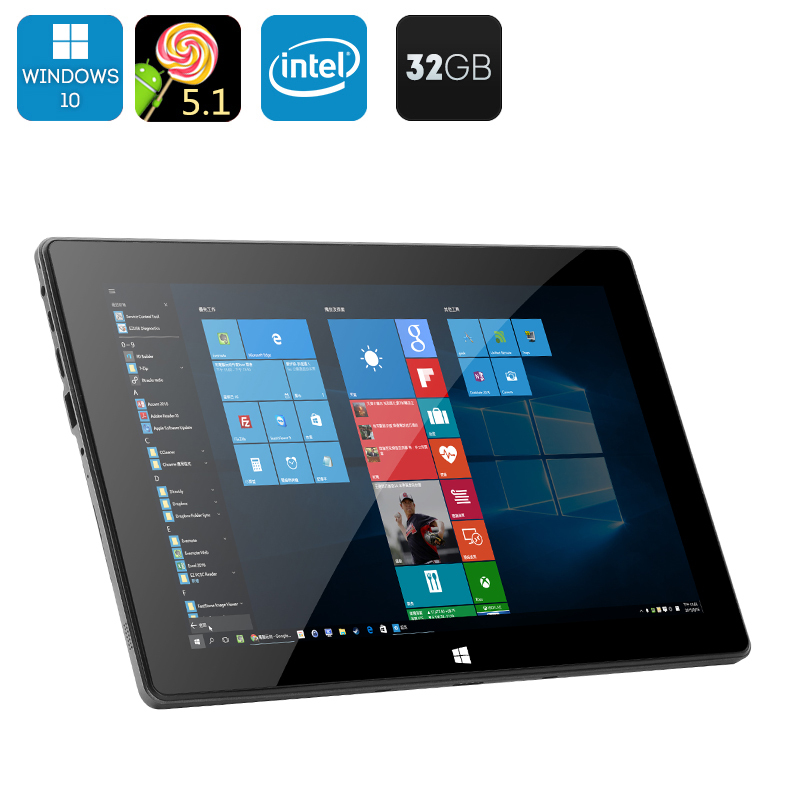 This dual boot Android 5.1 and Windows 10 tablet comes with a 12 months warranty and is brought to you by the leader in electronic devices as well as wholesale tablet PCs.. The OS versions on this device cannot be upgraded or flashed and any attempts to modify the default OS will void the warranty. As a wholesaler, we provide no software support, advice, or training regarding the Android Or Windows operating system and software. This product comes with an unlicensed Version of Windows 10 OS preinstalled.